No one likes bad breath or dirty teeth. So, brush your teeth, floss and get to your Collierville dentist, Dr. Joshua A. Holcomb, twice a year for check-ups and professional cleanings. Yes, those are good reasons for preventive dental care. However, they are not the only ones. Learn what happens at a routine dental appointment with Dr. Holcomb and his team and about the serious reasons behind what they do. Little microbes live in our mouths. Streptococcus mutans is the most prolific, living in the biofilm dentists call sticky plaque and hard tartar. This germ leads to tooth decay, and tooth decay leads to tooth loss and its many consequences. 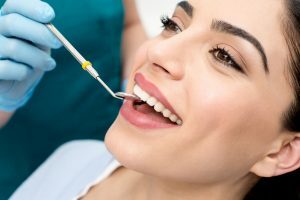 While a sugary diet and health conditions such as dry mouth (xerostomia) contribute to dental cavities, research shows that the Strep bacteria is the real enemy of healthy tooth enamel. Besides causing decay, oral bacteria living in biofilm attack our gums, causing redness, bleeding, pus, gum and bone recession, tooth mobility and ultimately, tooth loss. When plaque left untouched by brushing and flossing builds up at the gum line, gum disease (periodontitis) begins. This infection causes inflammation of the gums, but the inflammatory process doesn’t remain localized. All that being said, it’s important to both your oral and your overall health to keep ahead of plaque and tartar. Dr. Holcomb shares his examination findings with the patient and outlines preventive care and any needed restorations. He discusses the patient’s concerns and any cosmetic dentistry goals they may have so they can be incorporated into the treatment plan. Kids and adults both should maintain their dental cleanings with twice daily brushing and once a day flossing at home. Additionally, a low carb, high fiber diet keeps tooth surfaces clean. A minimum of eight glasses of water a day keeps oral tissues moisturized and washes tooth surfaces. Water stimulates saliva production, too, and its natural antibacterial benefits. Dr. Holcomb and his team firmly believe in preventive dentistry. So if you have not scheduled your regular cleaning and exam, please do so. Contact Dr. Joshua A. Holcomb today. We look forward to partnering with you in achieving your best oral health.